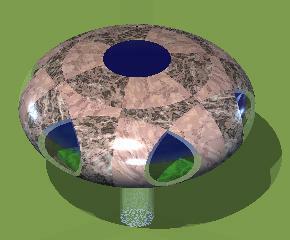 This option for the design of the outer shell of the universal terrestrial dwelling is based on a 2:1 circular ellipsoid. 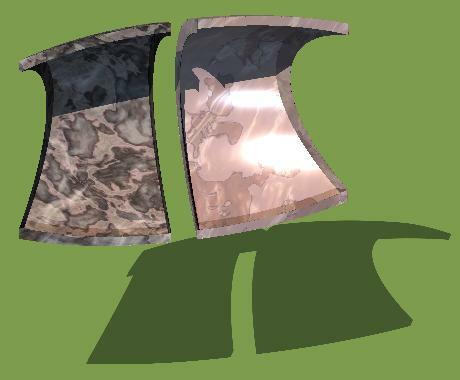 This is effectively sliced into flanged component panels, which are fixed together along their flanges to form a complete ellipsoid. The dwelling comprises a set of separated areas, each of which is dedicated to a particular type or class of human activity. From experiment, I deduced that the ideal size and shape for an activity-area is a 5-metre diameter circle. So, what is required is an envelope to encl­ose and protect each 5-metre diameter circle of activity-space, thus turning it into a 3-dimensional activity-volume. The requ­ired clearance height above floor-level is determined by the height of a human be­ing. Allowing for adequate head clearance, this is somewhere between 2 and 2½ metres. The ideal shape for this envelope is provided by a 7 by 3½ metre circular ellipsoidal shell, my own generic design for which is shown on the right. The shell is made up of specially shaped panels. Adjacent panels are shown in slightly different textures in order to make them distinct. 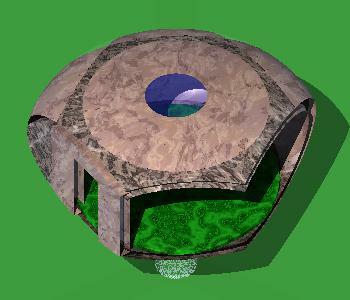 The green pattern of the 5-metre diameter circular floor inside the shell can be seen through the cat's eye window panels. The shell is supported on a 1-metre diameter transparent post, which raises the floor to 3 metres above the ground. The shell panels are made of metal, carbon plastic or some other material of appropriate strength to weight characteristics. The central circle in the roof of the shell is a 2-metre diameter skylight. 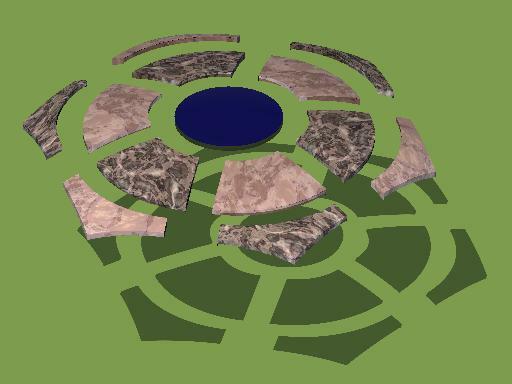 An aerial view of the generic form from which the petal, hub and patio units are formed is shown on the left. The shell is made up of only 5 different panel shapes, as follows. 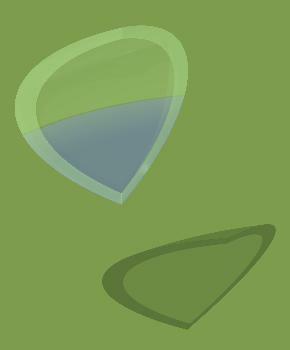 Other transparent materials can be used in place of glass. The frame panel is the darker shape with a hexagonal outer edge and a circular inner edge. Removing a side panel and its two adja­cent corner panels effectively slices the shell along one side of its hexagonal fra­me panel. The hexagon is five metres across its flats (5 metres AF). 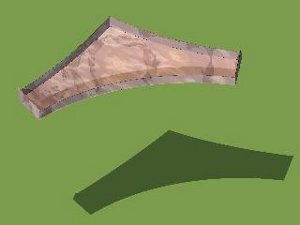 This slicing leaves an elliptical opening 5 metres wide by 2½ metres high - the same 2:1 aspect ratio as the ellipsoidal shell. 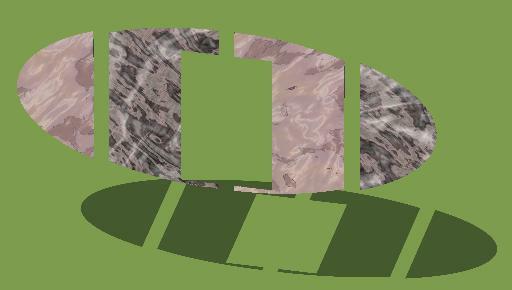 The sliced edge of the inner skin of the unit can be seen through the opening in the outer skin. The inner skin merely illustrate the clearance thickness of the shell wall - in effect the inward extent of its padding and ribbing. Through the elliptical opening can be seen the green pattern of the petal unit's 5 metre diameter floor panel. 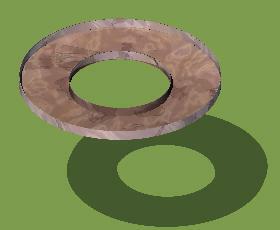 After the slicing, the elliptical hole created is filled by an elliptical wall. This 5 by 2½ metre elliptical wall comprises a central panel and two end panels as shown by the lighter and darker textures. The central panel contains a 1 by 2 metre cut-out for a doorway. A sliding door mechanism can be accommodated in the body of this central panel. Slicing this generic ellipsoidal unit to form the straight edge allows units to be joined along their straight edges to form the much larger daisy module. 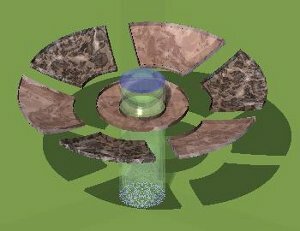 The 6 petal units that fit around a hub unit each need only be sliced off on 3 sides to create 3 flats as shown on the left. Each petal unit is supported by a transparent cylindrical leg 1 metre diameter. The cen­tre flat of each petal unit mates with one of the 6 flats of the hub unit. They thus share the same central panel that provides a doorway between them. The two flats each side of the central flat of each petal unit each meet with a similar flat on each of the two adjacent petal units. The left flat is shown with a wall unit comprising a cen­tral section and an end section. This provides a doorway between adjacent petal units that is blocked off with a door blank where a door is not required. A view of the petal unit from the part that faces away from the hub unit is shown on the right. The two corner panel windows - that remain after the slicing process - app­ear in this view like a pair of cat's eyes. Through the right-hand window can be seen the doorway in the wall panel that would lead to the adjacent petal unit. Thro­ugh the left-hand window can be seen the open areas left by the slicing off of the shell along the other two sides. The transp­arent support pillar 1-metre diameter sup­ports the whole petal unit so that its int­ernal floor is 3 metres above the ground. There are many ways of configuring the window areas of a petal unit. Another of these is as shown on the left. Here, the central side panel is made of transparent material to form a large single panoramic window, while the two corner panels are now filled in with opaque material. 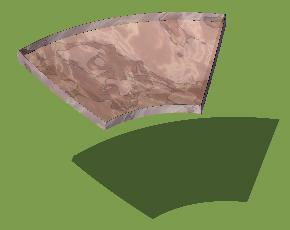 The two corner panels are shown as darker material to contrast with the larger pan­els so that the separate adjacent panels of the shell can be distinguished. A small part of the dividing wall can be seen on the right through the window. The patio unit is a form of petal unit with the window side panel and the large cir­cular roof panel removed. Through the opening left by removing the window side panel a semi- footbridge is mounted. This meets with the semi-foot­bridge of the patio unit in one of the other daisy modules. The corner panels each side of the foot­bridge may be removed if a more open aspect is preferred. This view is from an elevation of 45°. By slicing off all the side and corner panels and then installing on each side a central panel described above, we form the hexa­gonal hub unit shown on the right. Being a hexagon, this unit will now fit to­gether with others. 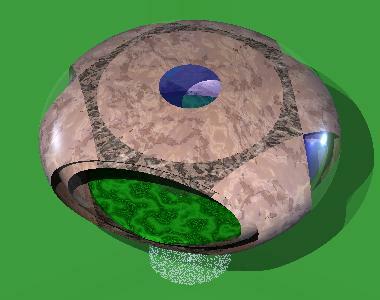 It can thus act as the hub unit at the centre of a daisy module. The doorways on each of the 6 sides pro­vide access to petal units that can be join­ed to this central hub unit. The hub unit is supported by a 2 metre diameter transparent cylinder. This contains a helical staircase that connects the floor level of the hub unit to its outside ent­rance at ground level. 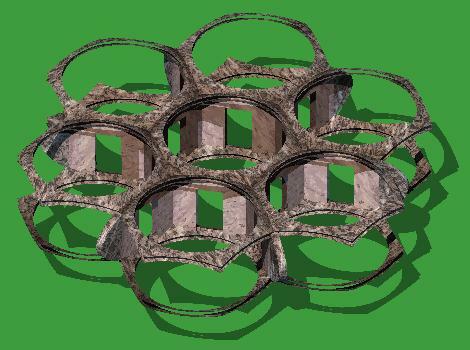 A complete daisy module is formed by sur­rounding a central hub unit with 6 activity shells. The six activity shells thus become petals surrounding the central hub of the daisy. This exploded view separates the various units from each other for clarity. Four of the petal units are fully enclosed while two are open patio units. Each patio unit has a half-section of footbridge protr­uding to connect to the other two daisy units that make up the complete dwelling. 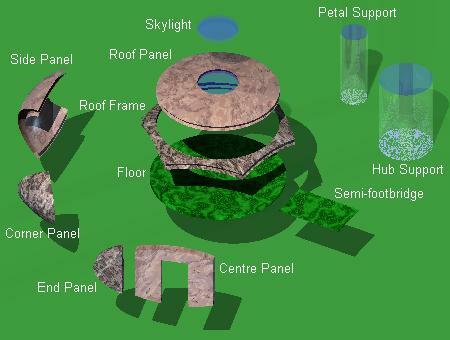 The space within the hub, petal and patio units of the daisy are divided by elliptical wall panels. Each of these has a central door opening. These can be clearly seen within the patio units shown in the 45° view on the left. The centre of each 4½ metre diameter circular roof panel cont­ains a 1½ metre diameter skylight. This is made of double-skinned glass or of some other suitable transparent material. Certain of the peripheral panels of the petal units are also made of transparent material instead of the opaque materials of which the majority of each shell is made. The more horizontal view of a daisy module which is shown on the right shows the six transp­arent pillars, which support the petal and patio units, and the wider central pillar which cont­ains the access staircase lead­ing into the hub unit. The two cat's eye window units of one of the petal units are visible on the left. An oblique view in thro­ugh one of the foot bridge entrances and on through one of the inner doorways can be seen on the right. On the left is shown the complete set of inner wall panels that divides the space within a daisy module. This structure com­p­rises 12 centre panels (shown in the lighter texture) and 6 end panels (darker texture). The structure is shown in its nor­mal position 3 metres above ground level. The shadows help one's perception of the shapes and positions of the panels. The sun is at an elevation of 50° and the struc­ture is viewed from an elevation of 41°. On the right is shown the complete frame­work of the daisy unit. This is produced by adding the hexagonal top and bottom frames for the hub unit and each of the 6 attached petal units to the basic wall struc­ture shown above. The daisy unit is completed simply by ad­ding all the necessary panels previously described, plus the circular floor and cylin­drical support for each unit. On the left is an aerial view of the compl­ete dwelling. It comprises three modules - one for each of the 3 classes of human activity - work, rest and play. 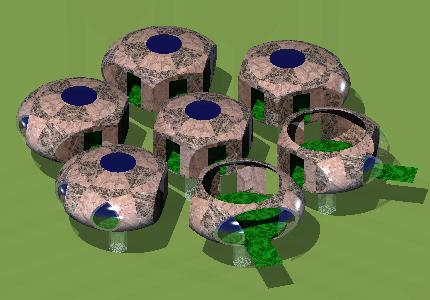 The 3 daisy modules are joined by a triangle of open foot bridges, which link the 3 pairs of semi-enclosed patio units. These provide comm­unication between the 15 completely en­closed petal units, of which there are 5 per module. The 15 fully-enclosed petal units, the 6 semi-enclosed patio units and the 3 completely open foot bridge units together form a central open space that is progres­sively defended towards its outer perim­eter, while affording a free vistal view to the outside world from each foot bridge. 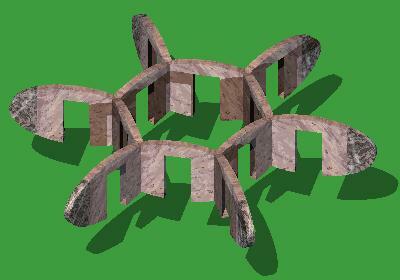 Below is a horizontal view of the complete dwelling. It shows the transparent pillars that elevate the whole dwelling to the first storey level above the ground. 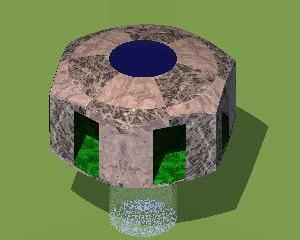 A narrow (1 metre diameter) pillar supports each of the peripheral petal and patio units. 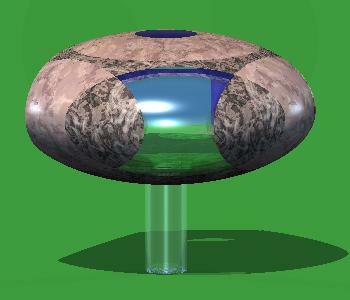 A larger (2 metre diameter) pillar supports the hub unit at the centre of each module. This contains either a lift or a helical staircase. 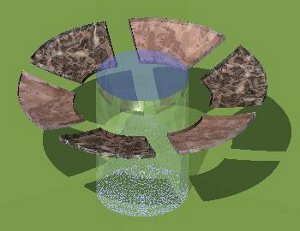 Below is a series of exploded views of a petal unit. 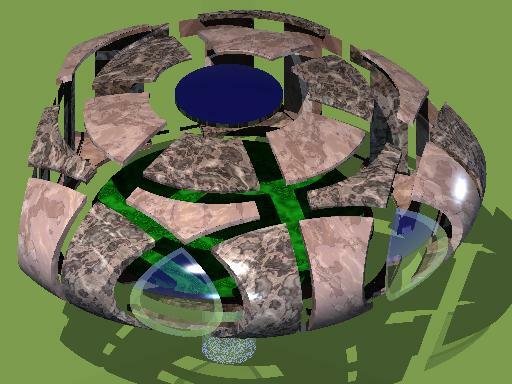 This shows all the panels, of which it is made up, moved radially outwards from the centre. 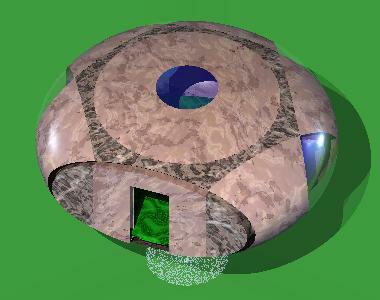 The green floor panel can be seen inside. The first picture (top left) shows all the panels forming a complete petal unit. The second picture (top right) shows the top panels only. The third picture (bottom left) shows the peripheral panels and the final picture (bottom right) shows the bottom panels. Following are illustrations of the individual panel-types. On the right is shown the bottom centre panel. This is an anulus to reduce the 2-metre diameter hole in the bottom of each peripheral unit to fit the 1-metre diameter glass support rod. It is absent in each of the hub units because the glass support is 2 metres diameter. 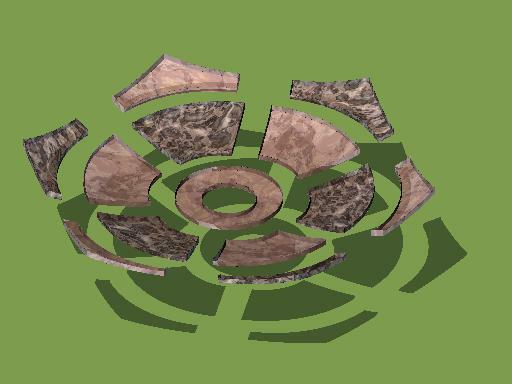 On the left is shown the segment panel, These fit around the central anulus. 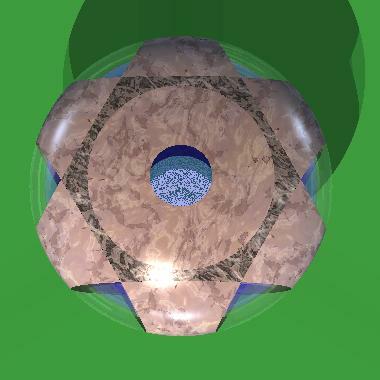 The triangular panels (below left) fit around the circle formed by the segment panels, creating a large hexagonal cap. Below on the right is shown a mirror pair of peripheral panels. Below on the left is the glass cat's eye window panel and below on the right is the 5-metre diameter floor panel. Below on the left is shown the 1-metre diameter support post with bottom centre panel surrounded by the 6 bottom segment panels. Below on the right is shown the 2-metre diameter hub support post (containing staircase or lift) surrounded by the 6 bottom segment panels. Finally, below is shown the arrangement of panels that make up a dividing wall. A single instance of each component is shown below. The side panel and the corner panel also come in glass versions for the side windows. The roof panel is the same item as the under panel and the roof frame is the same item as the under frame. The central hole in the roof and under panel is actually 2 metres diameter. A 25 cm wide filler ring is used with the skylight. A 50 cm wide filler ring is used with the petal support. No filler ring is needed with the hub support. Tooling guides for forming the panels could be made by slicing a complete hollow ellipsoid as des­cribed earlier. 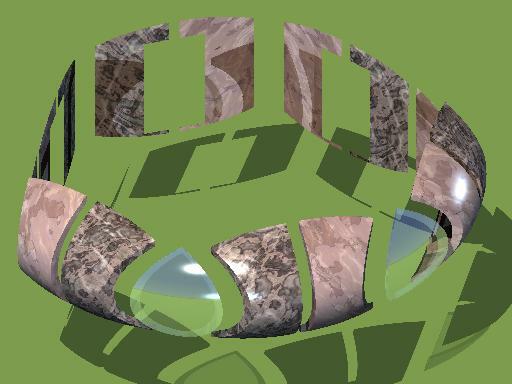 Alternatively, large scale images generated using the POV-Ray pro­gram could be printed out on large drafting machines. Profile measurements for the panels could then be taken from these images. 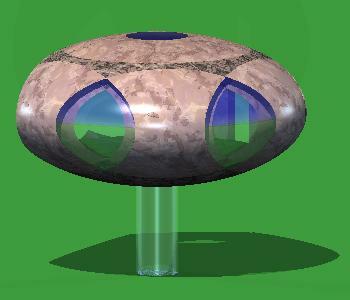 Assembly of the universal terrestrial dwelling could be facilitated by incorporating magnetized peg-and-hole locators along the edges of the panels. After assembly, the panels could then be permanently secured by bolts. 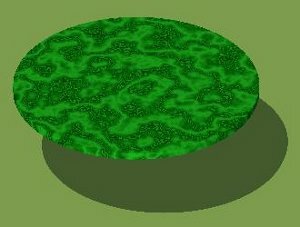 The POV-Ray program used to generate these images is here. 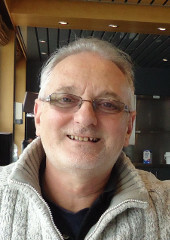 The different views and slices were generated by the selective commenting out of all but the sections of program needed to generate a particular image. Below is a table of all the panels needed to build the dwelling. 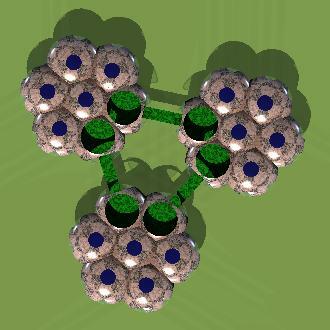 In addition, we need 3 Hub Supports, 18 Petal Supports and 21 Floors. All these panels can be made of reinforced plastic, non-inflammable polystyrene (DIN 4102.B1) or even paper mash. The moulds necessary for forming them can be made by forming the complete 7 metre diameter by 3·5 metre high solid circular ellipsoid, then slicing it into pieces along the flange planes. 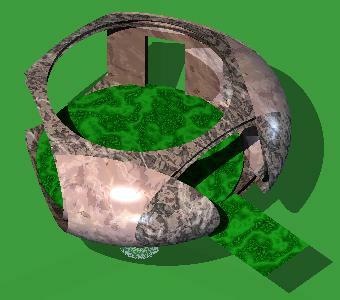 This design provided a good envelope for the 21 circular activity spaces of the dwelling. However, the overall appearance of the dwelling seemed over-geometric and lacked aesthetic appeal. It also gave the appearance of comprising too many elements. 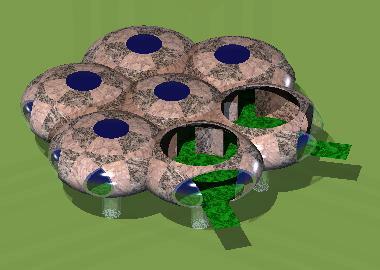 I therefore embarked on the next design which, while preserving the prin­ciple of smoothly enveloping the circular activity spaces, yielded a less complicated envelope that was more aesthetically appealing.